Sales growth in a restaurant business can be challenging, but is not impossible to achieve. If you sell wine in your restaurant, it is important to dedicate your time and effort in creating an attractive modern wine display. Find out how a Vancouver restaurant with a small wine storage space was converted into a beautiful and effective commercial wine cellar that will surely bring increased revenue and profits for this business. A boring presentation of wine means that your restaurant is losing money; it’s losing money in potential wine sales, a huge part of a restaurants profitability. In addition to great food, excellent service and quality wines, the way you display your bottles matters a lot. 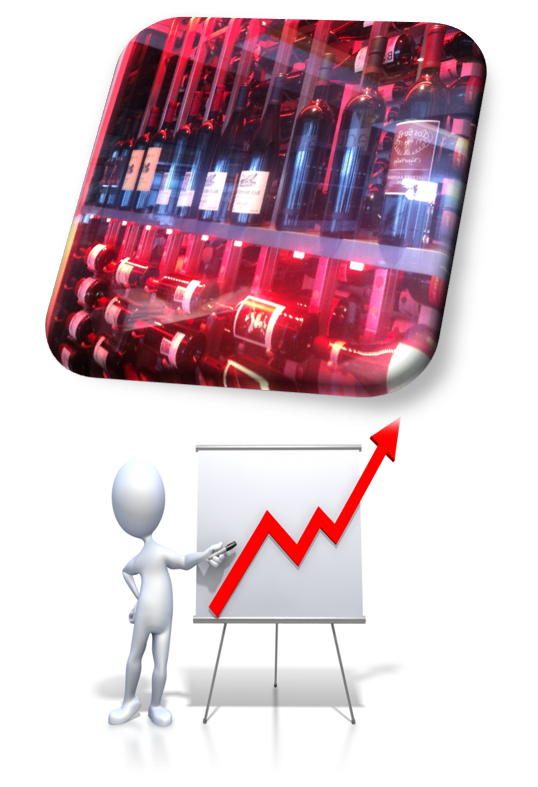 Beautiful commercial wine displays is one of the keys to achieving increases in wine sales. You’re not going to encourage customers to purchase your wine if you keep the bottles in the corner of your restaurant, on boring shelves or standard cabinets. On the other hand, making an effort to make your storage display as stunning as possible is an effective strategy in drawing people’s attention. A restaurant with good wine presentation will tell customers that you have excellent wines to offer, as well as provide them a relaxing atmosphere while they’re eating their favorite meal. For these reasons, many restaurants in Vancouver, Canada are investing in a climate-controlled commercial wine cellar. When designed and installed by an expert, your wine room will not only showcase your wines beautifully, but it will also maintain a stable environment for proper preservation of your vintages. Having a well-built wine room in your restaurant creates a relaxing atmosphere for your customers, and allows you to provide quality wines, which will make your customers happy, and lead to increases in sales. In Vancouver, British Columbia, you will find the Salam Bombay, an Indian restaurant that offers excellent food and great selection of wines. The owner, Jose Madappilly, recently had his old wine storage system converted into a functional and appealing Vancouver restaurant wine cellar. 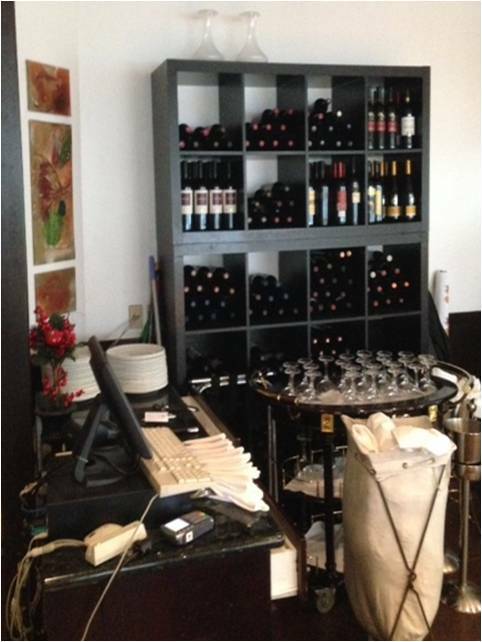 Located adjacent to the bar area, the wine storage area is small. The Champagne, reds, and whites were all displayed in modular wine racks, with some bottles stored vertically, and some on top of each other. Although ideal for limited spaces, the modular wine racks were not perfect for a contemporary restaurant that aims to increase sales. They are plain and unnoticeable. So, the client talked to Blue Grouse Wine Cellars, and requested a more effective commercial wine storage solution that fits the small space. Small wine rooms are a challenge to builders. For this project, the room only measures 6 feet wide, 5 feet deep and 9 feet high. As always with limited spaces, Blue Grouse Wine Cellars designed a modern wine racking system that maximizes storage capacity. Metal wine racks from Vintage View were installed. Floor-to-ceiling and wall-mounted racks were installed in the Salam Bombay wine cellar. Designed to fit narrow spaces, metal racks are in demand in restaurants and other commercial establishments. They also display wines like they are floating in the air, making the wine cellar look more elegant. Prior to the conversion, the client used modular wine racks which stored the bottles on top of each other. With this bottle orientation, finding a specific vintage required removing one bottle after another to check the labels. With the label-forward design of Vintage View metal wine racks, wine labels are not hidden. Locating and serving wine is not a difficult task anymore. Custom wood components were incorporated in the racking. The display shelf was added to showcase the restaurant’s featured wines. A cabinet was also built by Blue Grouse to hide the cooling unit. The owner wanted a frameless look in their commercial wine storage space. To achieve this, Blue Grouse used single-pane glass for the wall with the door. Other walls were constructed with insulated glass, except for the back wall, which is made of wood. 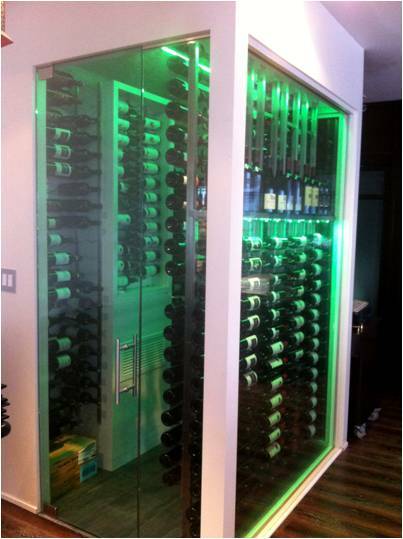 Glass enclosures are perfect for restaurant wine cellars because it gives your customers the opportunity to enjoy the commercial wine display visually from outside the storage room. It also creates an illusion of wider space. In addition being unattractive, the restaurant’s old storage system was not cooled by a commercial-grade wine cooling unit. The air conditioner used in the restaurant could not provide the wine the ideal temperature and humidity that would prevent their wine from being damaged. The worst thing that can happen to a restaurant that sells wine is for a customer to buy a bad bottle or glass of wine from your restaurant. This will create a negative impact on your business’ reputation, and might make customers decide not to come back to your establishment again. Keep in mind also that wine presentation, quality, and service all contribute to customer satisfaction. 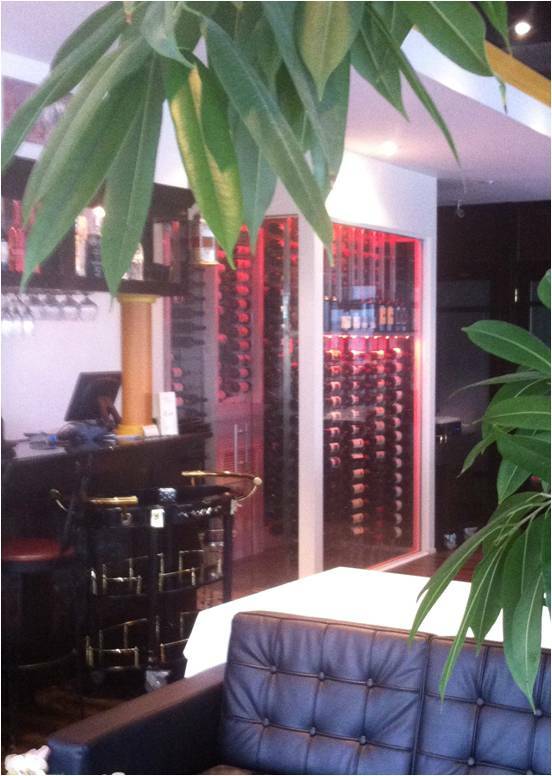 In this project, Blue Grouse used a wine cooling system suitable to the limited space intended for modern wine display. The self-contained refrigeration equipment is a product of ONAM, a brand of cooling units trusted by Vancouver commercial wine cellar builders, because of its efficiency, flexibility, and easy installation. 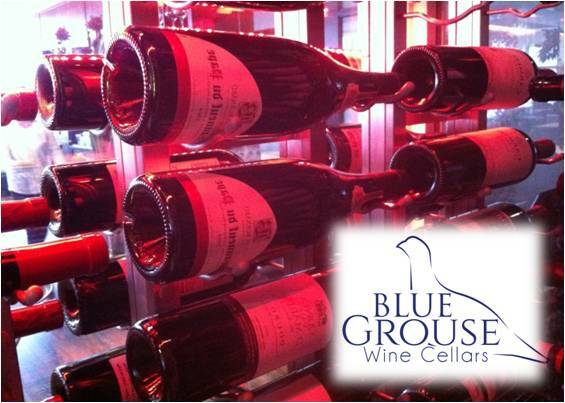 Allow Blue Grouse Wine Cellars to help your business boost wine sales. With our team’s passion and craftsmanship, we can transform your small space into an effective and aesthetically pleasing wine cellar. 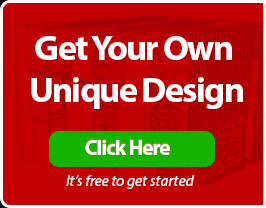 Contact them now at +1 (888) 400-CORK (2675) or request a 3D custom wine cellar design for FREE!